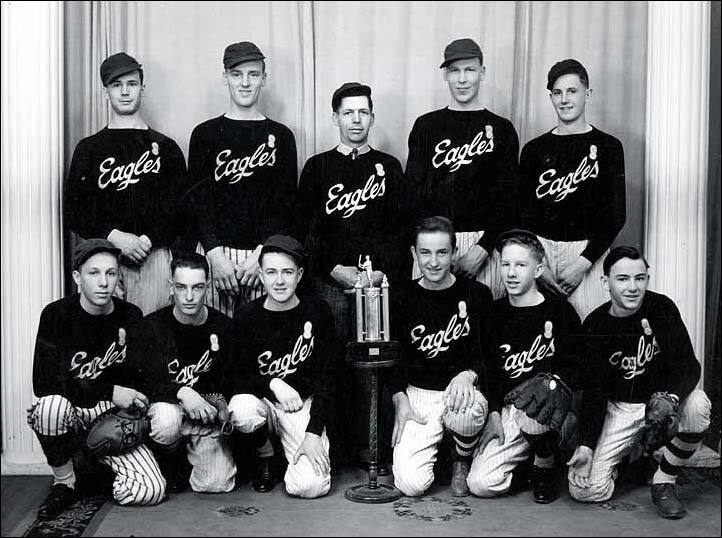 (August 4) Magrath Eagles, Friday night climaxed a successful season by blanking New Dayton 4-0 and clinching the championship of the Southern Alberta league and taking possession of the Eaton trophy. Much of the credit for the club's showing is due to Coach "Baldy" Rice who coached his boys to 16 consecutive victories, 15 in league and one in playoff competition. New Dayton handed the local lads their first setback of the season, a 6-5 defeat, in the second game of the best of three playoff series. Rice sent his ace pitcher, Sanders, to the mound for the deciding contest and the youthful flinger came through in his usual sensational manner, setting the opposition down with one hit and facing only 31 men. Sanders has compiled a remarkable record this season. During the past eight games he has hurled one no-hitter, one one-hit contest and two two-hitters. He has also tossed one three-hit game and a six-hit performance. In one contest he whiffed 18 opposing batsmen and has a total of 79 strikeouts for six games, an average of 13 per game. Sanders' mates were held to five hits by the New Dayton chucker, Kucheran, with Walter Pashuk leading the assault with three safeties. Cal Alston collected a singleton and Blaine Leishman banged out a game-clinching homer.